I owe someone at the Shout! Factory a thank you. Parker Lewis is one of those show I forgot about but loved watching, and now these lovely people have put it on disc. Originally airing in September of 1990 Parker Lewis was the perfect lead in to the New Fox network Sunday nights. Parker is a High School junior and he and his buds make the most of everything. It’s kind of a variation on the cool high school kid as seen in Ferris Bueller and other movies, but very quickly it becomes apparent that this is something wholly its own. A typical episode has them on an adventure and it almost always include the use of cool tech and ingenuity. In episode 11 they duck into a locker to escape something and discover a secret door to an abandoned radio station. They clean it up and go on the air as Radio Free Flamingo, playing classic rock and dispensing advice. Another episode has them trying to help freshman bud Jerry win the Science Fair, not knowing the principal has bet against them. Part of what makes this work is the cast. Corin Nemec stars as Parker, you may remember him from later in his career when he was in Stephen King’s The Stand, or maybe Stargate SG1. His pals Mikey and Jerry are played by Billy Jayne and Troy W Slaten. 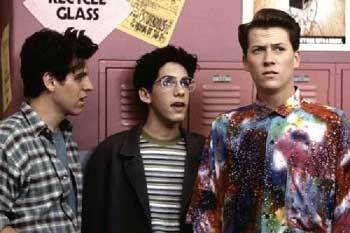 The school tough guy is Abraham Benrubi who plays Larry. Benrubi was Jerry on E.R. These four guys together on the screen is magic and always funny. They have great timing together and working together must have been great because they seem to be genuinely friends. The cast is rounded out by principal Musso , Melanie Chartoff, parents played by the hilarious Timothy Stack and Mary Ellen Trainor. Another piece to the puzzle of why this worked so well was the look of the show that the directors created. Cool angles, creative use of dollies to move characters with the camera and wonderful sound effects added to give it a cartoony feel at times. I was 26 when this first aired and high school was a bit behind me, but the show brought it all back as did rewatching it on DVD, and it brought back the fun stuff that made me almost miss high school, almost. There is a feature on the set with up dated interviews with the cast and it’s cool to see their take on the show 19 years later. All in all I’d call Parker Lewis Can’t Lose a lost gem and I’m glad it’s back and can’t wait for the next set.